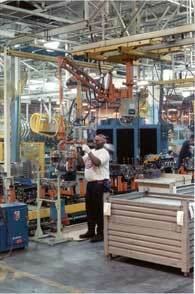 DOMINION INDUSTRIAL RESOURCES SPECIALIZES IN PROVIDING MATERIAL HANDLING AND ERGONOMIC EQUIPMENT FOR A WIDE VARIETY OF INDUSTRIAL APPLICATIONS. OUR EQUIPMENT IS OFTEN CUSTOM DESIGNED TO MEET SPECIFIC REQUIREMENTS THAT OFF-THE-SHELF EQUIPMENT CANNOT PROVIDE. WHERE POSSIBLE, STANDARD COMPONENTS ARE INTEGRATED TO PROVIDE THE REQUIRED SYSTEM THEREBY REDUCING COSTS AND MAKING REPLACEMENT PARTS MUCH EASIER TO OBTAIN.